The new dial and hands have Superluminova luminescence. The coin bezel case; this has no sub-seconds but a large visible sweep red hand. The back of the watch is engraved with historical data and dates - email for a photo. 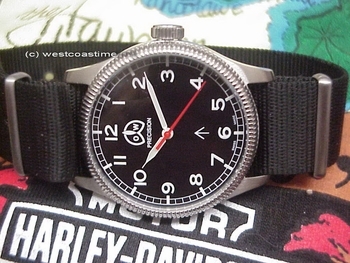 This is a classic looking watch and once they are sold there will be no more. This is more a collectible than a beater altho at 298.00 it is hard to find something this nice that is affordable for every day use. The movement is of new manufacture. I shall only send a watch that runs and keeps reasonable time. Smart looking on the wrist. The watch is 37.5 mm in diameter w/o crown and 43 mm lug to lug and 11 mm high with its slightly round crystal of hardened mineral glass. Legible and easy on the eye and yet different than any timepiece anyone around you might be wearing. Water resistant to 3ATM but not a diver just against splashing and rain with a friction crown and a screw down stainless back. This watch is yours for 298.00 plus shipping - please refer to item no. A-120. This watch has the real potential of becoming a collectible over time altho of course there is no guarantee to that effect but the movements and cases are now gone and the look is highly desirable. As always we welcome your comments, impressions and corrections when applicable regarding copy, please feel free to email even if not buying we enjoy hearing from you.